The Knolls Resort Motel provides visitors to the southern Jersey Coast with a good, low-cost lodging option. 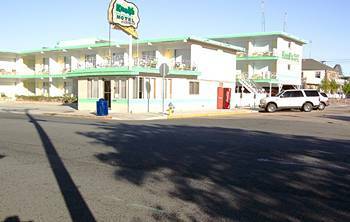 Among the motel’s best attributes is its location. Found at the southern tip of the state, it offers proximity to a number of great attractions, including beaches, the boardwalk, waterparks, and the Morey’s Piers amusement complex. Other examples of area attractions include the Wildwood Doo Wop Museum and the Cape May Lighthouse. The list goes on, and for those who are in town for a special event, it is just three blocks to the Wildwoods Convention Centers. As is true of other motels in Wildwood, New Jersey, the Knolls Resort Motel has plenty of historic appeal. This doesn’t mean that modern amenities are lacking, however. In the recently redecorated rooms, the available amenities include such delights as a mini-fridge, a microwave, and cable TV. High-speed internet access, complimentary in-room coffee, an alarm clock, air conditioning, and heating also come standard. Outside of the rooms, guests will find ice and vending machines, an outdoor pool, and a sun deck. Available services include babysitting, room service, daily maid service, and photocopy service. Guests should also know that they can request door to door trips to the Atlantic City casinos and obtain discounted tickets to Morey’s Piers.